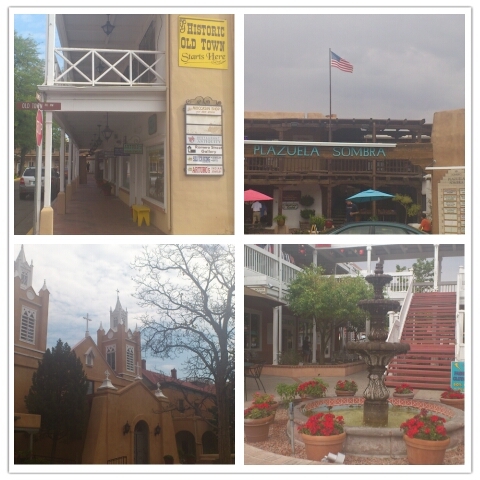 This morning we decided to explore Old Town, Albuquerque before we took off for another 6-7 hour drive to Arizona. Old Town is approximately 10 minutes away from the airport/University of New Mexico area that we were staying around. It is made up of old adobe-styled stores, restaurants and buildings. In the center is a square with a gazebo and a large church. This reminds me of a small town in Mexico we visited when we went to Cancun. The shops sold local art, jewelry, and along one of the sidewalks were about 10 artisans, mostly of Native descent, selling their hand-crafted items. I really liked exploring Old Town, looking at all the original and hand-crafted art work and souvenirs. In the end, I picked up some salsas/hot sauces unique to New Mexico region, as well as some standard souvenir items. It’s unfortunate I didn’t really have room for any of the local art items such as the pottery or the rugs, otherwise I would’ve purchased more. Since we hadn’t had breakfast yet and it was coming up lunch time, we made a quick stop back at Frontier Restaurant (which I covered in my last day’s post) for some tasty New Mexican brunch. As it was lunch time and school was in session at the University of New Mexico, the restaurant was quite busy. It took about 5 minutes in line before I was to order, but it was only about 5-10 minutes before my order was made and my number was called. As we were in a rush to get back to the hotel to check out, we took the order to go. I ordered a 1/2 order of the enchilada again as it was sooo tasty. My bf ordered the Frontier Burrito – which is now my new favorite! The main difference is that his burrito was smothered in beans and beef with green chili, then topped on the outside with cheese and green chili stew, whereas my enchilada only had beef and green chili stew (no beans or green chili). 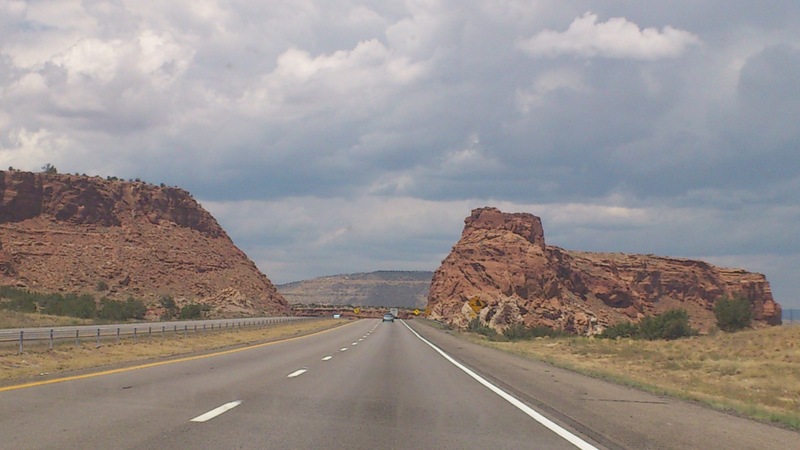 We then headed off on a 6-7 hour drive to Arizona. 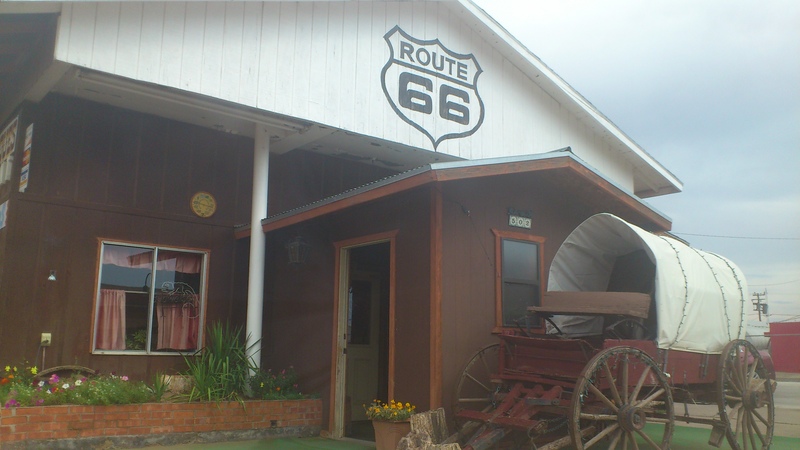 Although our GPS did not take us on the Route 66 historic route (which takes you from Illinois to California, famous for various landmark stops across the states), we did travel to different parts of the truck stops that distinctively connected Route 66 and the interstate highway I-40. One of which we stopped off in for gas and bathroom break was a town called Holbrook, which lives off of being on the Route 66 due to its shops all having “Route 66” on the outside to attract people. The odd thing about following a GPS is that sometimes it takes you the shorter route, but not always on the main highway. For the last half of the trip, we went off the interstate and took the Beeline Hwy, which took us on back routes of Arizona. We saw large forest areas when we were expecting desert. For a moment it felt like we were driving the Oregon/Washington highways with all the forested trees! 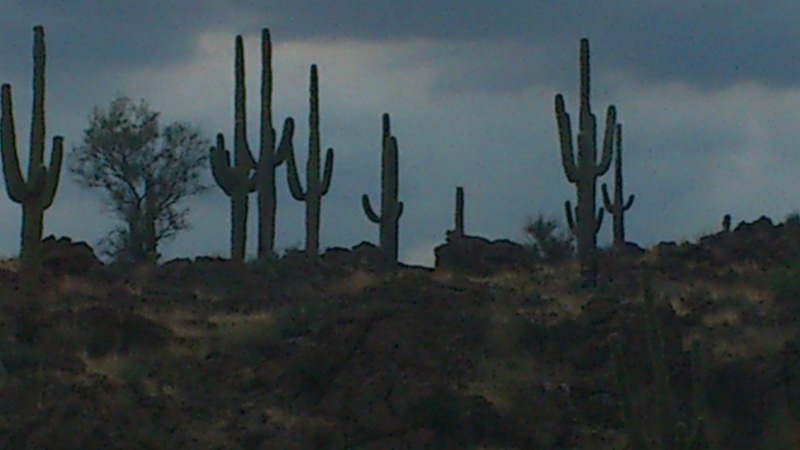 Eventually we started seeing cactus and LOTS of it and we knew we were heading the right direction. We checked into our fancy 4* hotel resort in Scottsdale. This place felt like a resort you could find in Mexico or Cuba. However I was disappointed to find out my cellphone reception (which is also my internet on the road) was spotty and couldn’t be received in our room, as well as that there’s only free wifi in the business center and in the lobby. We gave up on getting internet and headed out for dinner. 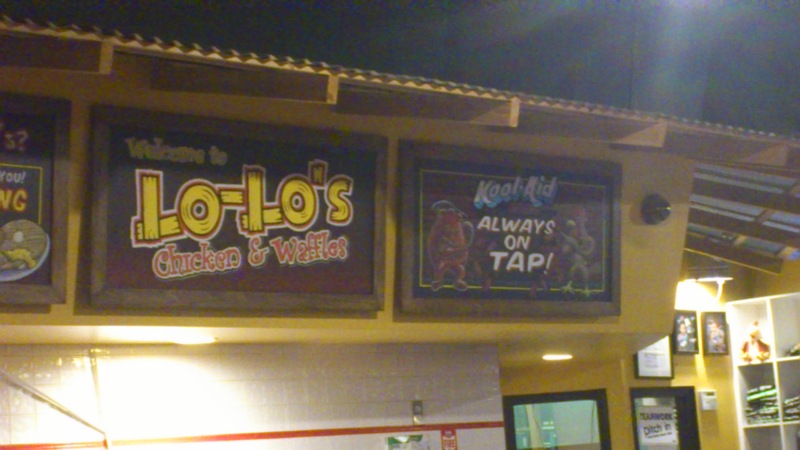 Urbanspoon listed LoLo’s Chicken & Waffles as a great spot near our hotel. 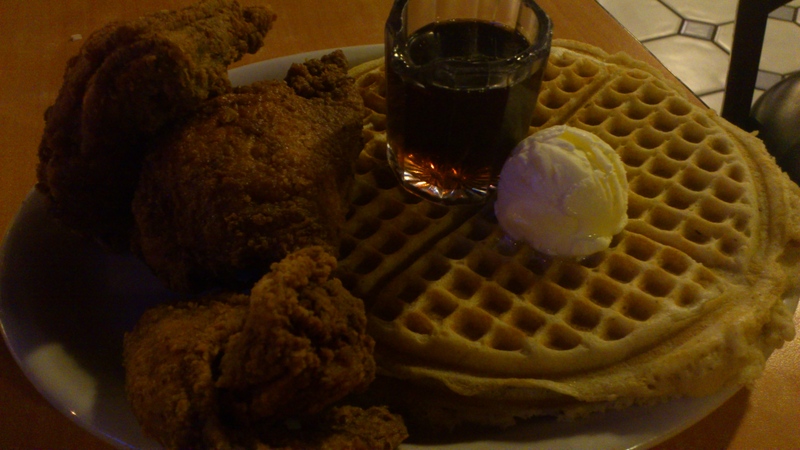 We had to check this out as we loved chicken & waffles that we had on our New York trip last year. My bf ordered the 3 piece chicken and waffles meal (which included 2 large waffles). 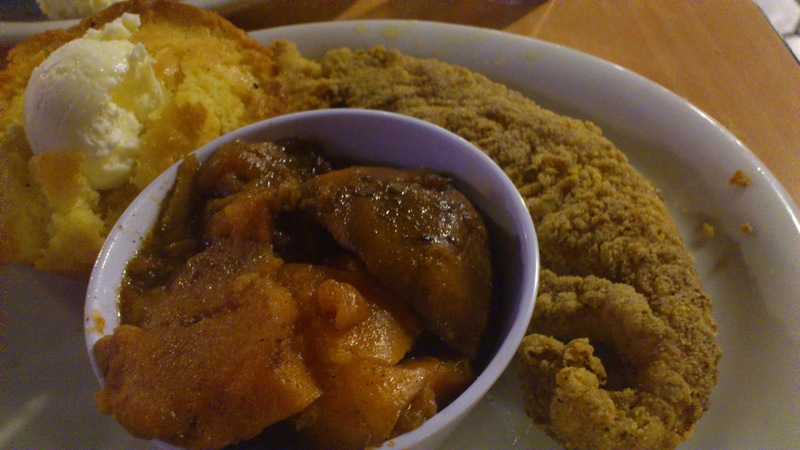 I ordered 1 piece of catfish, 1 cornbread, and candy sweets (sweet yams). The chicken and the waffles were delicious – however we still felt that the New York chicken & waffles we had were out of this world. However, the catfish I ordered was…WOW! Melt in my mouth delicious. I would come back time and time to eat this if I could! After the initial crunch of the batter, the catfish was fluffy and melted in your mouth like butter. The cornbread was nice and fluffy, however we were both too full to finish it so we brought it back to the hotel for breakfast snack tomorrow. The candy sweets (yams) were pretty delicious but I found them a tad too sweet for me so I treated them like dessert. We didn’t even have room when the server came by to tell us they had banana pudding, some cakes, etc. Luckily we didn’t order any drinks otherwise we wouldn’t have probably been able to finish them! The drinks were in really big jars and they have various pop, Kool-aid, sweet tea and lemonade. Definitely this is a place worth trying in Scottsdale if you want Southern cooking. Remember to try the catfish! They also have a location in Phoenix. We then went back to the hotel to relax and work off the food with a dip in the “heated” pool (honestly I think they tried to keep the water cold, but the heat outside just kept it warm..like a bath!) before calling it a night. We’re off to Phoenix to stay with a friend and enjoy some more good eats! Stay tuned!